Watch the show on SBS2 from 8.30pm on Saturday and Sunday nights from 7.30pm, arm yourself with Tweetdeck with a column search on #ifyouaretheone and join in the fun. Someone else in the room claps along to a candidate introduction. A funny sound effect is played. Candidate brings a gift or gifts for the girls. One of the girls gives advice to a candidate. #13 is chosen as the heartbeat girl. Candidate comes out of the elevator SHOUTING. Fedora. 2 drinks if a beard is involved. Meng Fei needs to explain a candidate’s answer. One of the girls is wearing something of questionable fashion sense. Heartbeat Girl looks unimpressed when she is revealed. One of the girls sing. The candidate performs a dance. The candidate is either a real estate agent or a used car salesman. Le Jia lays down the truth to a candidate. The candidate brings a gift for any of the hosts. Women in the friend video is a #lightkiller. A male on twitter says he would turn for a candidate. Meng Fei questions someone’s fashion sense. The girls actually get to the question stage. A girl cries while asking a question. Candidate blames girls for no date. Le Jia berates one of the girls. A girl throwing herself at candidate & he rejects her, going home dateless. The candidate performs with a girl, either a vocal number or interpretive dance. Either Le Jia or Meng Fei sings. CPU: One person with access to a beta testing unit says it has an i3-3220T CPU with standard HP Heatsink screwed to the motherboard. This bodes well for user-upgradable CPU’s! SATA PORTS: The beta unit only has one internal SATA port, contradicting earlier reports and HP documents that it will have two. Beta units are not necessarily the same as final shipping units. In fact, they just about never are. NEW BOOT DEVICE? Apart from the known USB2 port on the motherboard that many of us use a USB stick to boot ESXi or FreeNAS from, there is also now a micro-SD card slot on the motherboard. Again, this may not make the final product, but I like the idea! RAID5 CAPABILITY FIRMER: There is provision for mounting a Flash-Backed Write Cache (FBWC) on a bracket near the Optical Drive bay. The FBWC is the newer version of the cache & battery for the Smart Array cards. This is required for RAID5 operation on the b120i Smart Array controller, however the connector for this is yet to be found in the unit. There is also a whisper that with iLO4 features comes the normal Gen8 stuff – Smart Update manager (SUM), Intelligent Provisioning, Insight Manager/Insight Online, Active Health, ProLiant ‘Sea of Sensors’ and other features that are found on the higher end Gen8 ProLiants. 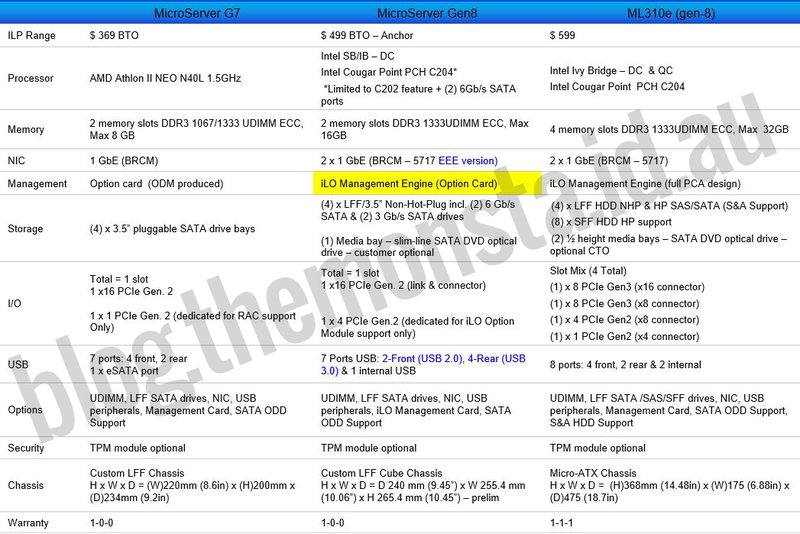 It seems that HP are really taking the Microserver to the enterprise.